Drug and medical device companies are responsible for delivering safe products and for warning about potential risks. But manufacturer negligence and flaws in the U.S. Food and Drug Administration’s approval process may put millions at risk of serious, debilitating injuries — including death. People injured by drugs and medical devices turn to the legal system for help. Americans expect drug and medical device companies to adequately test for safety and effectiveness before selling their products. But this is not always the case. Some injuries caused by bad drugs and faulty medical devices are life altering and leave a patient and family buried under medical debt. In some cases, families lose loved ones because of side effects. In spite of these safety issues, pharmaceutical and medical device companies make billions each year. In 2015, prescription drug sales reached an all-time high of $425 billion. Analysts predict it will reach $610 billion by 2020. The U.S. remains the largest market for medical devices in the world, with a market size of $140 billion, according to the U.S. Department of Commerce. Fortunately, the law gives consumers remedies when they are injured because of a manufacturer’s negligence, and people injured by faulty drugs and devices may choose to file lawsuits for compensation. Prescription drug and medical device lawsuits involve a special area of the law known as product liability. For most people, filing a lawsuit is the only way to get compensation for injuries that cause physical, financial and emotional hardship. While each case is unique, product liability claims all have certain claims in common. When filing a product liability lawsuit, the plaintiff must prove that the drug or device that injured them is defective. Product liability claims allege the product is defective in three ways: failure-to-warn defects, design defects and manufacturing defects. Lawyers refer to marketing defect claims as failure-to-warn claims. Failure-to-warn claims are some of the most common types of cases. Marketing defects are flaws in the way a company markets its product, such as insufficient instructions on how to use a product, improper labeling or insufficient safety warnings. Design defect cases refer to when the drug or device’s design may cause an injury because it is “defective and unreasonably dangerous.” For example, people injured by metal-on-metal hip implants claim the defective design caused these implants to fail early and injure people. Manufacturing defects may be claimed when design and marketing are proper, but a mistake occurs during the manufacturing process that leads to a defect. While people can try to file lawsuits on their own, it is a smart decision to hire a product liability lawyer. Cases against Big Pharma and medical device companies can be complicated and involve specific points of law. These companies have large, experienced legal teams. So injured people should also make sure they have a legal team on their side to protect them. Product liability lawyers can help in a number of ways. They can explain legal rights and options in the event of drug or medical device recalls. They can evaluate the strength of the claim and file the lawsuit on behalf of the plaintiff. After filing a lawsuit, the lawyer can help negotiate a settlement in the case or take it to trial. 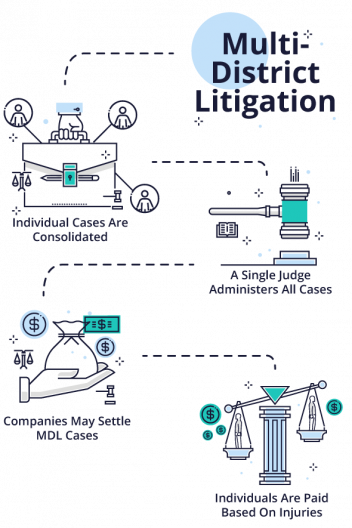 Lawyers can also explain the difference between filing a lawsuit as a class action or as part of multidistrict litigation (MDL). Get several case evaluations from a few lawyers. Choose a firm or independent lawyer. Sign a retainer agreement (contract). Lawyer will draft a complaint in state or federal court. Most people are familiar with the term “class action lawsuit.” Many assume that all drug and device injury cases are class action lawsuits. But this is not always the case. A class action suit is when an individual or small group of plaintiffs acts as a leader for a larger group of injured people. After filing a complaint in state or federal court, the lead plaintiffs — also called class representatives — ask the court to certify the lawsuit as a class action. The court may or may not decide to certify the case as a class action depending on the criteria. If the parties reach a settlement in a class action, their attorneys develop a plan for notifying potential class members and settling claims. Once the court approves the settlement, lawyers notify potential class members of their opportunity to submit a claim for a percentage of the settlement if they meet eligibility requirements. The disadvantage to a class action is that every member of the class gets the same settlement amount regardless of injuries. Individual class members don’t have control of their cases or get their own lawyers. Drug and device lawyers do not recommend class actions because severely injured plaintiffs may not have access to larger settlements because all participants get the same award regardless of individual damages. Instead, in cases like these, lawyers file individual lawsuits that may be a part of a group of cases called a multidistrict litigation (MDL). When dangerous drug and medical devices harm large numbers of people, personal injury claims can clog court dockets across the nation. In order to increase efficiency by allowing a single judge to oversee similar cases, a panel can consolidate the cases in a process called multidistrict litigation (MDL). MDL is not the same as class action, although an MDL can lead to a class-action lawsuit. 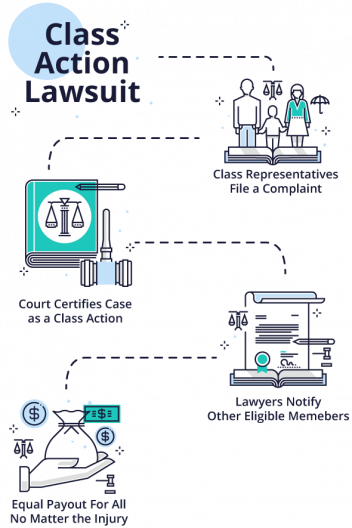 A class action is a single lawsuit with several similar claimants. MDL cases remain separate lawsuits. The court does not consolidate MDL cases for a common outcome in the same way that class-action members share in the same settlement or verdict. The Judicial Panel on Multidistrict Litigation decides when to transfer cases to an MDL. It usually occurs when there are large numbers of cases against common defendants and the courts expect more plaintiffs to file lawsuits. At the state level, a similar body or a state Supreme Court can decide to consolidate similar cases. A single judge oversees and administers cases in an MDL. This usually involves grouping cases with common factual or legal issues together for discovery, pre-trial hearings, trial scheduling and settlement conferences. This allows the court to address common issues that affect many cases at once. Companies may choose to settle multiple MDL cases based on early trial results. Each plaintiff can choose to participate in the settlement or not. Plaintiffs who suffer more serious injuries — such as those that require surgery or extensive future medical treatment — may be eligible for more compensation than those with minor injuries. In drug and device injury litigation, there is typically no fee for a consultation. In addition, these cases are also usually taken on a contingency fee agreement. This means the lawyers will not charge a client any upfront fees. The lawyer only gets paid if they obtain a settlement or jury verdict. After filing a lawsuit, the fee is usually 40 percent of the settlement plus costs. This information should be on the contract (retainer) you sign with the law firm. If it is not, make sure to ask the lawyer for his or her detailed fees before signing a contract. The internet is a good place to start the lawyer search. There are a few things to consider when looking for a lawyer. Remember that a high fee does not guarantee a better lawyer, but a relatively low fee could be a red flag. When it comes to litigating drug and device cases, an attorney who has experience dealing with Big Pharma and device companies is a good choice. While having a local attorney can be good, keep in mind that there are national firms that take cases from all over the country, and they may have more experience. Choosing a lawyer is an important step in moving forward with the lawsuit. Before making a final choice and signing a contract — called a retainer agreement — interview the lawyer. What experience do you have handling my type of case? What can I expect to pay in legal fees? Can you provide me with client recommendations? How will you inform me of developments in my case? Do you have any certifications or awards? A lawsuit goes through several phases on its way to settlement or trial. After the lawyer begins the process by filing a complaint, the drug or device company formulates a response and litigation begins. The process continues with discovery, motions and settlement or trial and post-trial. Product liability laws may vary depending on the state and product, and there may be a limited amount of time to file called a statute of limitations (SOL). Depending on the state where the plaintiff lives the SOL may vary. The time limit may also begin from the date of surgery, injury or when the plaintiff realized the product caused their injury. These are all questions to ask a lawyer. In drug and device injury litigation, there is typically no fee for a consultation. These cases are also on a contingency fee agreement. This means the lawyers will not charge a client unless they obtain a settlement or jury verdict. During the discovery phase of the lawsuit, both sides investigate the facts. Plaintiffs and defendants exchange documents such as company emails and other records. This is an important stage where plaintiffs try to discover exactly what a drug company knew about its defective product. The types of discovery are interrogatories, depositions, requests for admissions and inspection of documents. Interrogatories are written questions the parties send each other. These questions ask for details about the case including the location of all relevant documents, list of witnesses and the expected testimony of all experts. Lawyers prepare these answers after speaking with a client. Depositions are out-of-court, in-person interviews under oath. Each party takes the deposition of experts and the claimants. Lawyers can defend or object to questions. Lawyers from either side may refer to depositions later during trial. Inspection of documents entitles a party to inspect documents related to the case. This can include design drawings, emails or other relevant items in a party’s possession. Each side sends a written request to the other to produce these items for inspection. While discovery goes on, both sides may submit written motions to the court. These contain legal arguments and requests for the court. One popular motion for defendants is a motion for summary judgement. This motion requests the court throw a case out because there are no disputed facts. After discovery, the defendant may offer a settlement. The majority of product liability claims end in settlement before reaching trial. Most courts order both sides to attend a settlement conference. Judges or mediators oversee these conferences. If a case has not reached settlement, it proceeds to trial. In the case of groups of cases consolidated into multidistrict litigation, both sides agree to bellwether trials. Cases picked for bellwethers are cases very similar to the vast majority in the group. These trials test how juries will react to the information presented. Depending on how these cases go, they can lead to blanket settlements of all cases in the MDL or to more trials. Trials have several phases: jury selection, opening statements, plaintiff’s case, defendant’s case, closing arguments, jury instructions, jury deliberations and the verdict. Once a lawsuit makes it to court before a jury, the trial usually takes three weeks or more, depending on the complexity of the case. Drug and device companies usually appeal a verdict or argue for a new trial when they lose. The lawsuit process can take several years because of all the steps involved and the facts at issue in individual cases. Cases that reach settlement typically resolve faster than cases that go to trial. After trial and a jury verdict, defendants typically appeal when they lose, which adds more time to a case. In some cases, defendants appeal and plaintiffs appeal the appeal. While rare, some cases have gone on for a decade or more. Cases consolidated into MDL in 2012, settlement reached in 2014. Cases consolidated into MDL in 2011, settlement reached in 2015. Cases consolidated into MDL in 2010, settlement reached in 2015. Mesh implant lawsuit filed 2014, jury verdict reached 2017, case in appeal. Paxil lawsuit filed 2012, jury verdict reached 2017, case in appeal. Hip implant MDL formed in 2013, settlements reached in 2014 and 2016. Drug and medical device companies use laws that may drag out litigation, get cases thrown out or enable them to avoid liability. These tactics include legal tactics such as contributory negligence, learned intermediaries and preemption. Companies use the theory of contributory negligence to claim that plaintiffs contribute to their injuries by not taking reasonable care to protect themselves from damage. If a plaintiff didn’t use the product as directed, this may also be a defense. Depending on the court, this may reduce or eliminate compensation. But some courts may also bar manufacturers from using this defense. The learned intermediary defense states that if a drug company properly instructed or warned a doctor (or health care provider) who prescribed the drug to the plaintiff there is no liability. But plaintiffs can claim that direct-to-consumer advertising (such as TV ads for drugs) still expose companies to liability. Until 2009, drug companies could claim that preemption protected them from liability. According to preemption, federal law takes precedence over a state’s failure-to-warn laws. In other words, because the FDA approved a product’s label, manufacturers should not have responsibility. However, in 2009, the U.S. Supreme Court ruled that labeling approval by the FDA may not preempt state laws or protect companies from responsibility. If a company begins losing cases during trial or decides that it wants to avoid more loses in court, it may decide to offer settlements to plaintiffs. The degree of injury and financial damages determine the amount of the settlement in individual claims. In the case of an MDL, a company will offer one lump sum to settle thousands of cases. Plaintiffs in the MDL may decide to become a part of the settlement agreement or reject it and continue to trial. If they accept the settlement, the company calculates the award using a settlement matrix. This document includes a set amount for each claimant and provides information on how to evaluate and value each claim. For example, Takeda paid more than $2 billion to settle thousands of Actos (pioglitazone) bladder cancer claims. The company placed the money in a special fund and each claimant gets a base portion of the money. Then, the award moves up or down depending on the individual’s injuries. In the DePuy ASR hip replacement MDL settlement, the number of revision surgeries increased the settlement amount for individual claimants. According to the settlement matrix, if plaintiffs suffered dislocations or other complications of surgery they received more money. In November 2013, Johnson & Johnson proposed a $2.5 billion settlement, plus an additional $3 billion for medical expenses, to cover about 8,000 DePuy ASR hip-implant claims filed by people injured by the metal-on-metal devices. That same month, J&J paid $2.2 billion to settle charges from the federal government, which alleged fraudulent marketing of blockbuster antipsychotic Risperdal. The settlement also involved allegations J&J paid doctors and nursing homes kickbacks to promote the drug for unapproved uses. In addition to medical expenses, lost wages and other financial damages, plaintiffs may get more or less money based on settlement matrix factors. Negligence by drugmakers and device manufacturers has led to some high-profile legal claims. Too often, hundreds — sometimes thousands — of consumers are injured by a drug or device before it is recalled. Sometimes the FDA or manufacturers do not take action until a number of plaintiffs come forward with lawsuits. In 1974, complications with Dalkon Shield intrauterine devices showed how effective lawsuits can be in safeguarding public health. Lawsuits claimed the manufacturer marketed the device aggressively even though it was aware of safety problems. Litigation over the product resulted in millions of dollars of compensation for victims. It also brought attention to the manufacturer’s negligence and eventually helped take the product off the market. Product liability lawsuits offer similar benefits. Whether lawyers file claims before or after the FDA gets involved, lawsuits can put pressure on manufacturers and marketers to right their wrongs. A Missouri jury awarded $110 million to one woman who claimed Johnson & Johnson’s baby powder led her to develop ovarian cancer. A Philadelphia jury awarded $76 million to a young man after he took Risperdal and said the drug caused him to grow female breasts (gynecomastia). Takeda settled about 9,000 lawsuits for about $2.37 billion. Plaintiffs blamed the drug for causing bladder cancer. Stryker paid $1.4 billion to settle thousands of Rejuvenate and ABG II modular hip stem lawsuits. Plaintiffs claimed the hip implants failed early, leading to additional surgeries. Ethicon agreed to settle more than 7,000 claims for more than $4 billion. Patients implanted with DePuy ASR implants suffered infections, fractures, and bone and tissue death and needed additional surgery to replace failed implants. Bayer paid $110 million to settle more than 500 lawsuits. Consumers who took the prescription drug for birth control said they experienced blood clots. Pfizer agreed to pay $330 million to settle more than 2,200 lawsuits. The company was accused of hiding the menopause drug’s cancer risks. GlaxoSmithKline agreed to pay $460 million to settle 10,000 lawsuits. Claimants said the company hid heart attack risks associated with the diabetes drug. Merck paid $4.85 billion to settle a reported 50,000 claims. People who took the painkiller suffered heart attacks and strokes linked to the drug. Eglovitch, J. (April 2012). FDA Drug GMP Warning Letters Increase 6%, Focus on Supply Chain and Sterility Assurance in FY 2011. The Gold Sheet. Hensler, Deborah R. and Peterson, Mark A., Understanding Mass Personal Injury Litigation: A Socio-Legal Analysis, 59 Brook. L. Rev. 961 (1993-1994). In re AH Robins Co., Inc., 880 F. 2d 709 (4th Cir. 1989). Kolata, G. (1994, March 24). 3 Companies in Landmark Accord On Lawsuits Over Breast Implants. The New York Times. Memorandum and Pretrial Order No. 1415, In Re: Diet Drugs (Phentermine/Fenfluramine/ Dexfenfluramine) Products Liability Litigation (MDL 1203), NO. 00-1739, Brown v. American Home Prods.Corp., No, 99-20593 (E.D. PA, Aug. 28, 2000), available at http://www.settlementdietdrugs.com/index.asp?page=dsp_pto 1415.